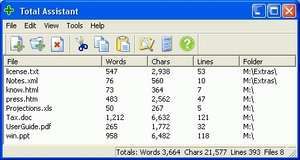 Total Assistant provides a simplified way to count words, characters and lines in one or more files. Just drag and drop the files. Total Assistant shows the counts for each file and the total for all files. It handles multiple files of differing formats including Word, Acrobat PDF, HTML, PowerPoint, Excel and more. Total Assistant 2.6.0 is a shareware program and can be used as a demo to try the software until the free trial period has ended. A full version of the program is available after the trial period ends. For security reasons, you should also check out the Total Assistant download at LO4D.com which includes virus and malware tests. Additional screenshots of this application download may be available, too. An excellent listing of free Excel tool downloads along with editors' input and suggestions for alternatives. A lot of programs in this category can convert, export and organize Excel spreadsheets. Check out some of the freeware downloads available in the excel addon category. They contain no strings and are available at zero cost.